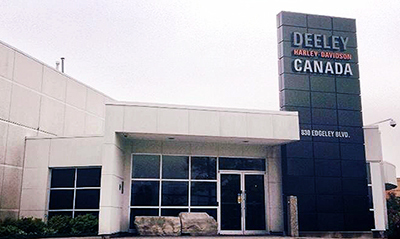 Harley-Davidson Ends Agreement With Deeley Harley-Davidson Canada. Will Distribute Directly To Independently Owned Canadian Dealers. Published by Cyril Huze March 1st, 2015	in Builders, Editorial and Events. Harley-Davidson will transition to a model of direct distribution to independently owned dealers in Canada by July 31, 2017, when the company’s current agreement ends with Deeley Harley-Davidson Canada, the exclusive distributor of Harley-Davidson products in Canada since 1973. The two companies are also in discussions about a possible agreement to move up the transition in Canadian operations to as early as the third quarter of 2015. As part of its global growth strategy, Harley-Davidson has largely migrated to a globally consistent model of direct distribution to independently owned dealers and, in recent years, has established direct distribution and operations in a number of its major markets including Brazil, Australia, Italy and the Scandinavian countries. Under direct distribution, the company manages sales to dealers, marketing, dealer recruitment and retail capabilities, consumer events and other aspects of its in-market activities, often through wholly-owned subsidiaries. Canada remains among the only markets operating through a third-party distributor arrangement. 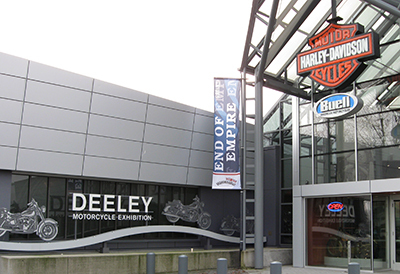 Don James, co-founder and majority owner of Deeley Harley-Davidson Canada, currently serves as a director on the Harley-Davidson, Inc. board. In Canada and globally, Harley-Davidson motorcycles and related products are retailed through a network of more than 1,460 independently owned dealerships. Please visit Harley-Canada for further information on Harley-Davidson® products in Canada. Wonder how distribution and training are going to work out? What a load of marketing bs.lol It’s good to see them cut out the middle man, I’ve never been a fan of Deeley, though I doubt that will result in any savings being passed on the the customer. A few new business oppurtunities in Canada…nothing 3-4 million wont fix…..
Well it’s about time. For many years most of us in border towns (Niagara Falls, Ontario) have had to run across to the U.S.A. to get a fair shake on prices for parts and used bikes. Deeley has been screwing us on prices and currency exchange forever. Dealers on the other side are not allowed to sell us new bikes. I wonder why (Not). Good riddance I say. In Tampa, Fl. for the winter. Prices will stay high, nothing ever goes down in price up here. Crude oil goes down ,gas goes up, this whole country is a rip off. HD better get a grip, their brand is gonna die here. or comparable to what you’d pay in the USA?